This is a cute, silly short show, and somehow I grew to care about the characters, too! Don't expect anything too deep (think comic strip - because that's the style) or big plot moments. It's subtle and simply adorable. There are definitely some laugh-out-loud moments, too! 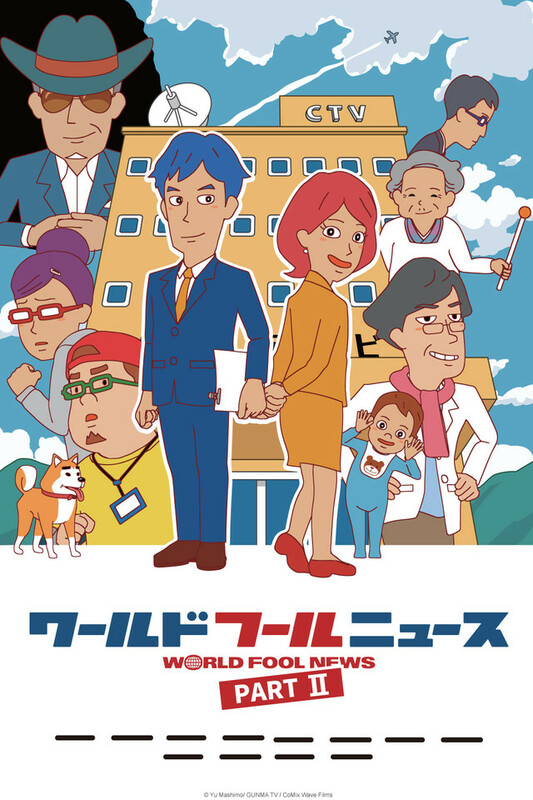 The main reason World Fool News found its way onto my queue was that it seemed like something my husband would enjoy. Well, he really did but I ended up wanting to watch it just as much! There were some really deep moments in this that made me think. While much of this is really centered around the Japanese culture, etc. there were some moments that were true for everyone. My favorite characters had to be Shimohira, the co-anchor, who is absolutely nuts...and yet sees the world very clearly. I loved seeing her upbeat look at the world every time. The other was Miki. The fourth episode is perfect for her and I laugh every time we even mention the television cables (hahaha!). I won't lie though, the animation took a bit to get used to and when the characters walk and you can see their legs...it just looks wrong. But, the colorful and unique animation does fit really well with the spirit of the show. Both the opening and closing songs are good and frankly, we dragged out watching these because we didn't want them to be over so soon! This show is so WONDERFULLY positive! IT'S LOVELY! ALSO HILARIOUS! LOVE IT! CAN'T WAIT FOR THE NEXT SEASON (IF there IS a second season) ! The shows are around 10 minutes long each episode . The details aren't everywhere (but that's just the animation style). It's a HAPPY toned show. There's actually some pretty deep character work. It got serious a few times during the season but I'm not saying it's not true to LIFE. It's ALSO got some EASTER EGGS in the show. GOOD SHOW!